The TTXGP (Time Trial eXtreme Grand Prix) was founded by Londoner Azhar Hussain, a successful entrepreneur in the Bluetooth electronic accessories industry. In June 2009, the world’s first zero carbon, clean emission motorcycle race was run at the Isle of Man TT. Out of 16 machines from six different countries, nine finished the demanding 37.75-mile road course. The winning machine was produced by major electric motor manufacturer, Agni Motor and clocked a top speed of 106mph and an average lap speed of 87mph. 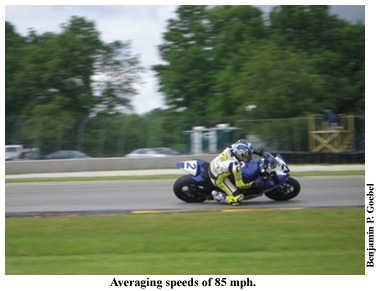 For comparison, conventional gas-powered machines were averaging over 130mph. The TTXGP is not only revolutionary in that it is the first zero carbon race series but also that the 2011 TTXGP rules are on Wikipedia. This is the first race series to use crowd-source input in the formulation of its rules. This is a brand new use for electric vehicle technology. By making the rule making process open, many different points of view can constantly be considered to make the series as relevant as it can be and to let it evolve with the technology. Further differentiating the series from other race series is the interesting fact that the TTXGP is following a co-operative business model–their goals being “to build a multi-billion dollar franchise, owned by those who are in it, while making the TTXGP a lasting and self-sustaining organization”. The TEO partnership (Trust.egrandprix.org) has a board, filled with members elected by the partners. The partners are the teams competing in the TTXGP. The only way to become a partner of the TEO is to race in the TTXGP. You can’t buy your way in with a fat wad of cash. The more you race, the more of a stake in the series you get. The teams competing in the inaugural season are being rewarded with a higher percentage. If the partners stop racing in the series, they leave the pool. New partners can join anytime just by going racing. Sounds like a very palatable investment opportunity. Just go racing. Regardless of one’s political/environmental views regarding the future of alternative transportation, electric vehicles will definitely be part of the mix. Part of the TTXGP vision is that it will foster developments that “can shift our world in a timely and meaningful way”. A quote from the web site of the world’s fastest production motorcycle, the Lightning, says that there are two paths to rapidly move technology forward, war and competition. The realities of racing development are that the technologies can’t be developed too fast. If your learning curve is too shallow-you will literally and figuratively be passed by someone else. 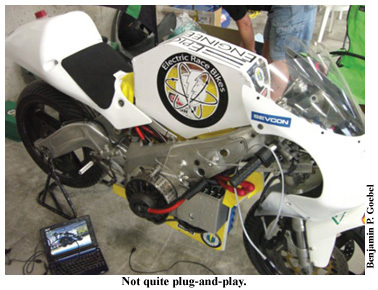 The enthusiasm and unbridled passion of motorsports racing is a perfect venue to rapidly advance the fledgling technologies surrounding electric motorcycles. And this is exactly what is happening. Because of the fresh, multi-discipline technologies involved, machine development is forging new paths. Because the series is new, teams can’t look back to last year’s data for a circuit to see what worked and what didn’t. The learning curve is so steep that teams often make major developments not just between races, but between practice, qualifying and the actual race! With so much pioneering technology being employed, every race is “essentially a Kitty Hawk”, says founder Hussain. The series is very uncharacteristic in the fact that the series technical rules are EXTREMELY unrestrictive. When I asked the engineers/constructors what their favorite thing about the series was, many answered the lack of constricting rules and the fact that this let them think outside the normal racing paradigms when designing their machines. The lack of design restrictions doesn’t mean that the machines are knitted together with string and bubblegum. The TTXGP is extremely concerned with event safety for rider, team, spectators, officials and track marshals. To enter a bike in the TTXGP, a Technical Construction File that includes schematics and pictures of circuit boards must accompany the race entry. Because the technologies in TTXGP are new and without precedent, the sanctioning body requires extensive information about the technologies “being used by each team, how they are to be applied, and what approaches have been taken by the team to ensure all safety issues have been satisfactorily addressed”. The Technical Advisory Panel exists not to exclude anyone, but to work with the teams, to ensure safety. The bikes are subject to technical scrutineering for compliance and for safety prior to practice and to the race itself just like an AMA or MotoGP race. The TTXGP has two techs, one for mechanicals and one for electrical. Many of the team principles come from very diverse, non-motorcycle racing backgrounds (Like A. Hussain said, “When is a sparky (electrician) part of a motorcycle race team?) Many of the things that the mechanical scrutineer catches are things that the teams didn’t know had to be done or might not know best practices for. The fact that they are dealing not with an internal combustion engine (or I/C power as they refer to it) but electricity presents its own hazards. The machines are packing hundreds of volts and could be a safety hazard to both riders and track marshals. All the machines have two safety shut-offs, one for the rider and one for the marshals. 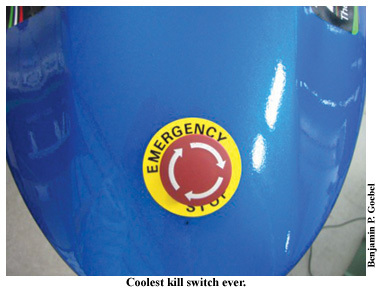 They also have a safety light that blinks when the bike is live. Corner workers are issued special 1000(! )volt-proof rubber gloves to prevent shock when handling a crashed bike. All of the machines are equipped with a horn to warn track personnel of their stealthy approach if necessary. The electric motorcycle is obviously a different animal than we are used to. An electric motorcycle is comprised generally of the rolling chassis, electric motor with its attendant motor control, accumulators (batteries) and their supporting cast the battery management system (or BMS) and charger. 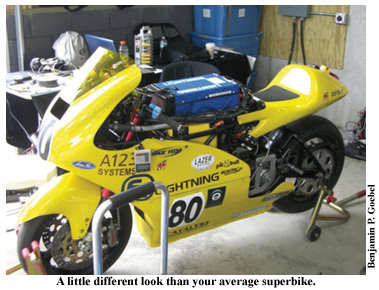 The TTXGP field runs the gamut for chassis design. The oldest chassis is a 1966 Norton Atlas; sporting the infamous McCandless featherbed frame design and a 70’s John Player Special fairing. When I asked about the non-existent gas tank, rider Thad Wolff said they were making a statement! Their choice of an older machine was based on wanting to be different, being of about that age and liking the older machines, and the low rolling resistance due to the narrow, old-school wheels. The newest chassis is the TTX02, built by TTXGP’s production company, Mavizen. They are using a current KTM RC-8 rolling chassis, a competent piece of engineering by any yardstick. The rest of the field was adapting mostly late-model, middleweight sport bike chassis to fit the bill. At this stage everything is custom, and not in the “go-to-the-motorcycle-shop-and-pick-it-from-the-catalog” custom. A thousand things need to be fabricated to convert the bike to electricity. The only purpose-built chassis is a technological tour-de-force, the Lightning. The Lightning holds the claim to world’s fastest production electric motorcycle at 166.38mph. Their choice to use a custom frame was based on packaging concerns. The motors and electronics are fairly small but batteries aren’t. Batteries take up a lot of space and they are heavy. The bikes are mostly in the 400-500lb range. All of the machines use increased suspension spring rates to control the extra weight. The heart of the beast can be an AC or DC motor. It could be brush or brushless. It can be also be a single or a double motor design. Output ranges from 35hp to 80hp. The Lightning spins out 130-140hp from a liquid-cooled AC motor that was used in GM’s stillborn EV-1 electric car from the 90s. Owner/engineer Richard Hatfield says that they have the potential to double this figure in the near future. This motor spins at 12,000 rpm while the rest of the bikes spin to about 6000 rpm. Electric motors make max torque from nearly no rpm. The need to apply power while leaned over in a corner necessitates having some sort of motor control. The motor control meters the power output based on user-programmable parameters. This part is usually in the form of three or four circuit boards each about the size of a king size candy bar. The energy for this show is provided by battery. Of course they are not common alkaline cells. Most of the teams are using rechargeable lithium polymer batteries. The Lightning and a few other teams are using very cutting edge lithium iron phosphate batteries or nano phosphate for short. These are the same batteries used in the KillaCycle, the world’s fastest electric vehicle. The KillaCycle makes over 500hp and can shred the quarter mile in 7.824 seconds at 168 mph. Its zero-to-sixty time is less than one second. The KillaCycle doesn’t make apologies or excuses for anything. Batteries are a major expense for all the teams- $4,000 to $8,000 per set. The way to make an electric motor make more power is to make it spin faster. You get it to spin faster by zapping it with more volts (746 watts=1hp) Herein lays a major design concern. More volts mean more batteries. More batteries mean more weight, more heat, and more packaging problems. Where do you put all those batteries? How do you keep the extra weight from affecting handling adversely? How do you lose the extra heat being generated by all the extra cells? The battery packs are very sensitive and sophisticated. The battery packs, made up of individual cells can be damaged by running them too hot or draining them too low or too fast. All of the hundreds of individual cells must be constantly monitored for problems. This is the job of the BMS. Rounding out the battery components are the chargers. This is separate technology of its own. Rich Rudman of Manzanita Micro Power Systems and self-proclaimed “Eco-Redneck” supplies many of the teams with very high performance, purpose-built chargers that can jam the charge back into the batteries in no time flat. At this time only the Norton and the Lightning are using regenerative braking. Regenerative braking turns braking energy into electrical energy, thus giving the rider more power in reserve. While user-configurable, they at this point are providing a 15-20% return. If one wanted to go e-racing without wanting to be a fabricator, Mavizen offers a turnkey bike for about $45,000. The bike is a rolling calling card for TTXGP technology. The bike is totally digital. It has ‘Intel Inside”, ride-by-wire, Wi-Fi, GPS, Bluetooth, a 4-inch touch screen and an Agni motor. The riding experience is certainly different than a conventional I/C-powered motorcycle. Most conspicuous is the lack of noise. The machines are far from silent. There is still tire, wind and drive noise. The sound the bikes make can be described many ways. Like an industrial table saw. Like George Jetson’s car. Like a dentist drill. Like a Star Wars land speeder. Like an electric lawnmower. Like a drum sander. Like regular motorcycles, each bike has its own particular sound signature. When the Lightning bike would wind up for testing in the paddock, ALL heads would turn to see what the source of the eerie, guttural wail was. While the sound is obviously unlike the siren song of the I/C motors that we are accustomed to, it is far from unpalatable. It’s the new sound of power. Jennifer Bromme, owner of San Francisco-based Werkstatt Motorcycle, team owner and racer of ten years, had a very interesting perspective on the issue of sound. She said that when riding, “noise is one of our greatest connections to what we perceive as power”. Without that medium, it leaves us somewhat untethered. “Things become more visual. It feels like you are floating, like you are flying and it is very addictive!” This feeling is similar to wearing very good earplugs while riding. Many of the riders said they could hear the crowd cheering and sometimes could catch some of the announcer’s words on the PA. Because of the lack of noise, a rider can be passed seemingly without warning. Some of the riders cited the lack of noise as the reason for clearer, calmer thinking while cutting laps. 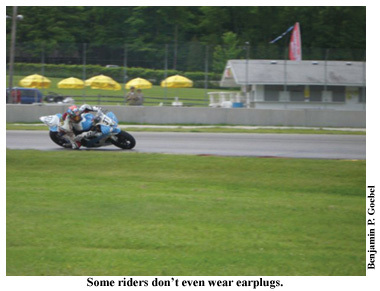 Sometimes a racer might NOT wear earplugs. Accompanying the lack of sound is reduced vibration. The machines are very smooth. Our beloved I/C motor has many internal rotating parts. These parts all contribute to gyroscopic forces that have an effect on handling. E-bikes have fewer rotating parts for less of an adverse effect on handling. Most of the machines have very little engine braking. Minnesotan Mike Hannas, famous for being the test rider who crashed the Tularis 2-stroke prototype, (now riding a converted Yamaha TZ250) said that off throttle feels like finding a false neutral on a regular bike. Zoe Rem who normally races a Ducati 848 and is racing a converted Suzuki GSXR600 in the series, says that off throttle feels very two-stroke like. All the bikes are one-speed machines. Some employ a CVT transmission as used in snowmobiles or scooters. As of yet no one is using a sequential, multispeed transmission. Jennifer Bromme said, “There is no shift distraction, just brake then get on the gas. And there are no missed shifts; it would be easier to learn for a beginning racer. Automatics would also be more conducive in appealing to a larger population.” The feeling of acceleration was described by John Bunne, an ex-Buell engineer, as starting out in fourth gear and winding out a Suzuki SV650. Conservation of cornering speed is a preferred technique so as to conserve battery power. More throttle uses more juice! 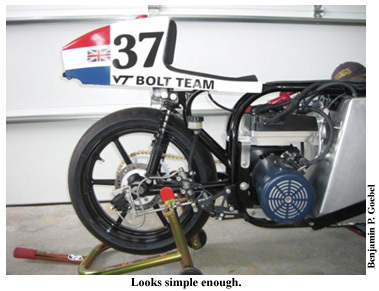 The Lightning Motors’ Bike won 1st prize in the second round of the TTXGP North American championship held at Road America. The Lightning’s best lap time was only 20 seconds slower than the best lap time of the new Harley-Davidson, no-tech XR-1200 series winner. The Lightning was about 45 seconds behind the Superbikes and about 30 seconds behind the 600s. The Lightning averaged 80.402 mph over the five laps of the 4.05-mile circuit and had a 121.572mph trap speed. Zoe Rem took second place on the AGNI Motors bike, making her the first female rider to podium at a TTXGP race. Thad Wolff came third on the Team Electra Norton bike. Jennifer Bromme of Werkstatt finished fourth. Mike Hannas placed 6th, a victim of excess heat buildup in the electronics resulting from Road America’s long, fast straights. The TTXGP 2010 North American Championship now moves to Round 3 at Mosport, in Canada on July 8-11th. As with other motorsports, major gains happen in fits and starts. As certain pieces of the performance puzzle improve, it makes it possible for other improvements in other areas to occur and so it goes. As batteries get more powerful and lighter, it will allow for better motors and better handling. The constructors unanimously agreed that battery technology was the current factor limiting machine performance. Interestingly enough, the size of the motors being used are about 8-inches in diameter and about a foot and a half long. In relation to what is available, this is a fairly small electric motor. What if they made the motor bigger? Raul Aguilar of Native Cycles said, “we are at 120mph now. Next year, e-bikes will be back at 150mph; three years from now, 180-200mph and five years from now we will be over 200mph”. It is important to remember when comparing electric bike technology with I/C is that I/C motors have been constantly refined for over a century. Constructor John Wild said, “its ideas now, not money”, but the fast, big gains are going to come when huge corporate cash gets invested in R&D. Jeff Major, Electrical Engineer for Team Lightning, made the point that the transporting, running and spectating of any stop on a large event like the AMA, Formula 1 or NASCAR tours produces an insane amount of carbon emission. It will go on for a while longer, but it will eventually not be acceptable anymore. Congratulations to Road America for taking a chance on the future and committing to run the series for three years. Racer Jennifer Bromme says the TTXGP lets her combine two passions, environmental consciousness and motorcycle racing. “Its guilt-free racing”. Electric motorcycles are more than willing to carry the torch. Any technical problems today are nothing more than teething problems that will soon be a distant memory. These new technologies will help lead public opinion away from our old biker gang image to one that is much more progressive.